The Naruto New Hennesy Circline Lefty 6.0" left handed shear is forged and hand crafted with an advanced sintered micro powered multi alloy steel, and then hand crafted to perfection for a cutting experience beyond your expectations. In this series; a three dimensional circular ride, for a soft and vendible packing is used in the bearing. Within this packing there are numerous indents so that the oil can penetrate and gain a softer touch for the perfect movement of the scissors. The Circline Lefty also includes a shaft bearing to the bolt to give a smooth and a light movement to the blades when cutting. The New Hennesy Circline Lefty 6.0" lefty also includes a shaft bearing to the bolt to give a smooth and a light movement to the blades when cutting. These are the most advanced left handed hair cutting tools in the world. This is a powerful scissor that features an offset set crane handle, and saber top blade. The Hennesy Circline Lefty 6.0 inch designed with a disk bearing Tension system. Excellent for all around and detail cutting at the highest level. The Hennesy Circline Lefty hair cutting scissor will cut with great precision, and power. The quality of Naruto with its sintered steel, and artisan craftsmanship will allow you to cut any section with ease. 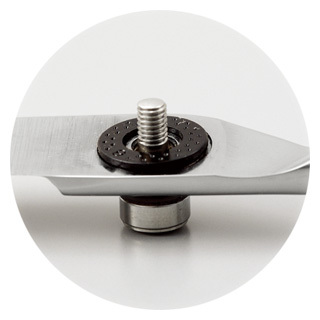 Below is an image of the bearing disk tension system that will reduce friction and allow user to cut smoothly with less effort, and thumb pressure.